Christmas, despite what our world tells us, doesn't start the day after Thanksgiving, but rather there is a period of preparation for the Christmas season called Advent. Advent begins the Sunday nearest to the feast of St. Andrew the Apostle (November 30) and includes four Sundays. So the First Sunday of Advent can begin as early as November 27 or as late as December 3. Advent is a time to prepare our homes, but most importantly our hearts, for the coming of Christ. Below are traditions we have done in the past. I have gradually added on to our family's traditions for the past 14 years and some most years we don't get to do all of them. 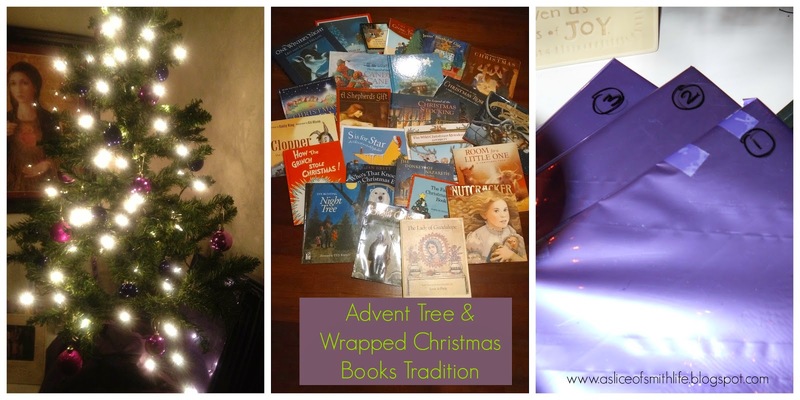 Maybe if you see a new tradition that I have listed, you will feel inspired to include it in your own family's Advent season. 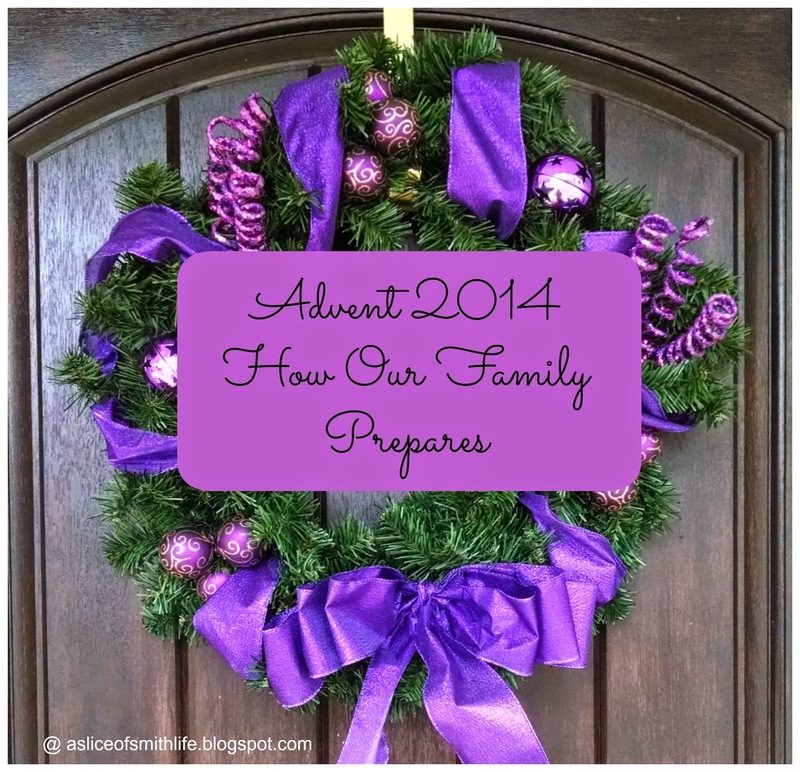 We try to incorporate our Advent traditions during our Couch Catechism devotional time each morning or in the evenings during and after dinner time when my husband is home from work. This Sunday, Nov. 30, 2014, marks the first day of the liturgical year in the Catholic Church with the first Sunday of Advent. Did you know the word Advent is from the Latin word advenio, meaning "to come"? It's hard to believe it is time to prepare for the celebration of Christ's birth! I truly think that one way to keep Christ in CHRISTmas is to embrace the Advent season with all its beauty and meanings. One of the first decorations we pull out is our Advent wreath which we display in our kitchen. After we eat dinner as a family we light the candle(s) depending on which week of Advent we are in. So during the first week of Advent, we will be lighting one purple candle after we bless our wreath with a special prayer. Set the candles burning bright. One by one each week we light. Not quite time to celebrate. It's Christmas joy for me and you! One year our homeschool group made kid-sized Advent wreaths using 1) air-dry clay, green Tempera paint, purple and pink chenille stems for candles, and yellow/orange dot stickers for the flames. 2) Each child got a ball of clay so they could form it into a wreath shape. 3) Then they painted the wreath green and placed 4 chenille stems ("candles") that I cut 2 inches long. I gave them 4 yellow/orange circle stickers and had them wrap one sticker around one purple candle. 4) The children can "light" another candle by placing a sticker on another purple candle as each Sunday in Advent arrives. So they can count down the weeks until CHRISTmas day with their own handmade wreath. Do you have a collection of your favorite Christmas books that you either own or borrow from the library and read each year? Several years ago I found a great way to read our Christmas books and at the same time have my children anticipate Jesus' birthday. I wrap up each book with purple wrapping paper. I usually find the purple paper in our local Dollar Tree store. Then beginning the first Sunday in Advent, one child opens one book and we read it as a family. Then on the second night in Advent, our next child opens a book and so on. My children really love this idea of opening their Advent Christmas book. I have a small "Advent tree" in our great room decorated with purple balls and under this tree is where we have our wrapped Christmas books. This small Advent tree goes up at the beginning of Advent and then we buy our real Christmas tree sometime later in December. I also number the books and put each child's name on the back of the wrapping paper so I don't have to remember who gets to unwrap the next book! Our Advent Tree is also used as our Jesse Tree and we read scripture as our children put one symbol per night on our small tree. (Pictured above is a picture of our original Jesse tree which was just a branch stuck in a pot of sand and the pot was wrapped with a purple cloth.) Our symbols are made out of paper and our children colored each picture several years ago. I then laminated them and punched a hole to tie a string to the paper. I made copies of these symbols from this page on Domestic-Church.com . There as so many ways to make Jesse Tree symbols that I have seen through the years (made out of felt, wood, etc.) and I hope to remake our symbols some year or buy some beautiful ones like the Jesse Tree symbols from JesseTreeTreasures on Etsy, but for now these simple paper symbols are working and will do. We have enjoyed reading The Jesse Tree by Geraldine McCaughrean in years past and we will continue with this tradition this year. 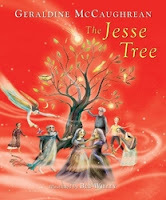 We read one story each night which relates to the Jesse Tree and its symbols. 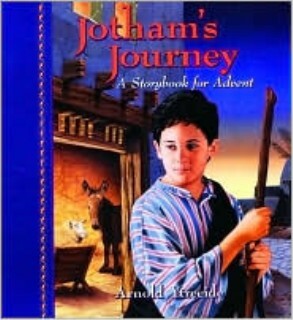 In years' past we have also read Jotham's Journey, A Storybook for Advent with our children, which is a great book that takes you and your family on a journey with characters who are living in Jesus' time. The young characters in the book are my own children's ages and so it is very enjoyable to read for the entire family. We will try to read it with using only the light from the candle(s). It's beautiful to see that as we get closer to the celebration of Christ's birth, each lit candle makes the room brighter and reading easier. I love how this symbolizes how we anticipate the coming of Jesus Christ, the Light of the world! Another Advent tradition in our family is reading the book What God Wants for Christmas. This is a beautiful story that is written in rhyme on each page. For example, the first page tells of the angel Gabriel from Luke 1:26. After each page the book directs the children to open one of 7 boxes which contain pieces to make the interactive nativity set. So in box number 1, they will find a little angel Gabriel figurine to place in the manger scene. The 7th box is when the children discover the best surprise...which is what God wants for CHRISTmas! 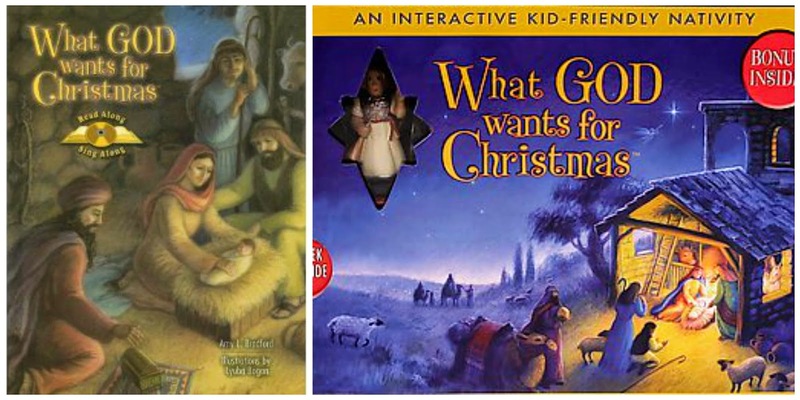 The book goes along with the interactive kid-friendly nativity set, which has the 7 boxes and the pop-up manger scene. *Note: I bought this book and interactive nativity set several years ago and it looks like it may be out of print, but maybe you can find used copies. Speaking of books, I'm excited to add two more books to our Advent /Christmas reading. The first book titled, The Amazing Giving Tree Secret, A Story of Kindness, Love, & Joy is written by Mary Ellen Fimbel, who is local author and a member of my parish. Mary is a dear friend and I enjoy listening to all the ways the Holy Spirit worked through her to remember and honor her grandchild, Andrew, who passed away at 6 months old in 2001. The proceeds from Mary's book will go to Andrew's Toy Box, a non-profit, charitable organization founded in memory of Andrew Fimbel, who passed away on February 17, 2001 from Spinal Muscular Atrophy (SMA). The disease is the No. 1 genetic killer of children under two. My children loved this book and with so many giving trees during this time of year, it would be a perfect story to share with your family during this Advent season! Our family and homeschool group also donates toys to Andrew's Toy Box during Christmas and throughout the year to help sick children smile. The second book, called Jesus' Birthday Gift is a treasure also and is written by Mary's sister, Michelle Boggiano. This book is full of beautiful colors and illustrations and has a wonderful message that goes along with the story of Jesus' birth. I also love the fact that some Spanish vocabulary is sprinkled throughout this beautiful story. Proceeds from this book will also go to Andrew's Toy Box. 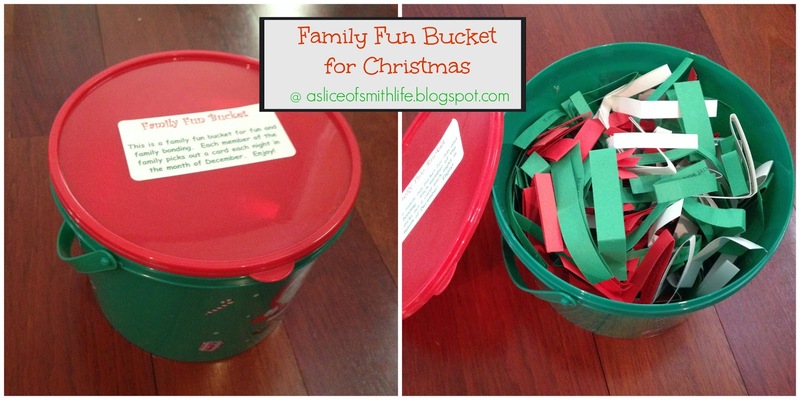 Several years ago a friend of mine made this family fun bucket for our family and it has become one of the best Christmas gifts and a family favorite Advent/Christmas tradition! To read more about the Family Fun Bucket and how to make your own with free printables, click HERE where I guest posted at Upside Down Homeschooling! 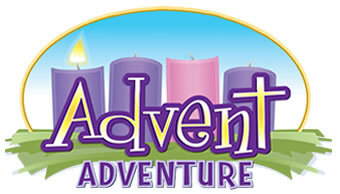 So if you are looking for another great way to enhance your Advent season with your family, check out the Holy Heroes website and enjoy your adventure! 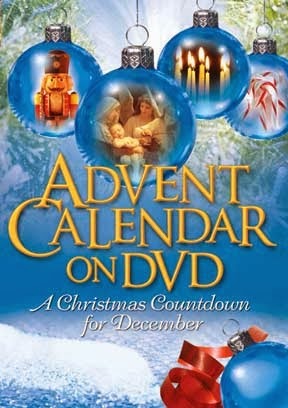 An Advent resource we just bought last year is a DVD called Advent Calendar on DVD, A Christmas Countdown for December. Each day in December there is a short video clip, about 2-3 minutes long, that talks about various topics including Advent history, origins of Christmas carols and Christmas traditions, and just various topics surrounding the Christmas season. It's very interesting and holds everyone's attention, adults and children alike. We also have this fun fabric Advent calendar and this beautiful wooden calendar displayed in our home so our family can count down the days to Jesus' birth. Another Advent tradition we have done in the past is prepare a soft bed/manger for Baby Jesus. I first saw this idea on Holy Heroes Advent Adventure and thought this would be a fun and simple way to have my children prepare their hearts and souls for the true meaning of the Christmas season. You can read more about the Christmas creche, which started with Saint Francis, with the great children's book, Saint Francis Celebrates Christmas. 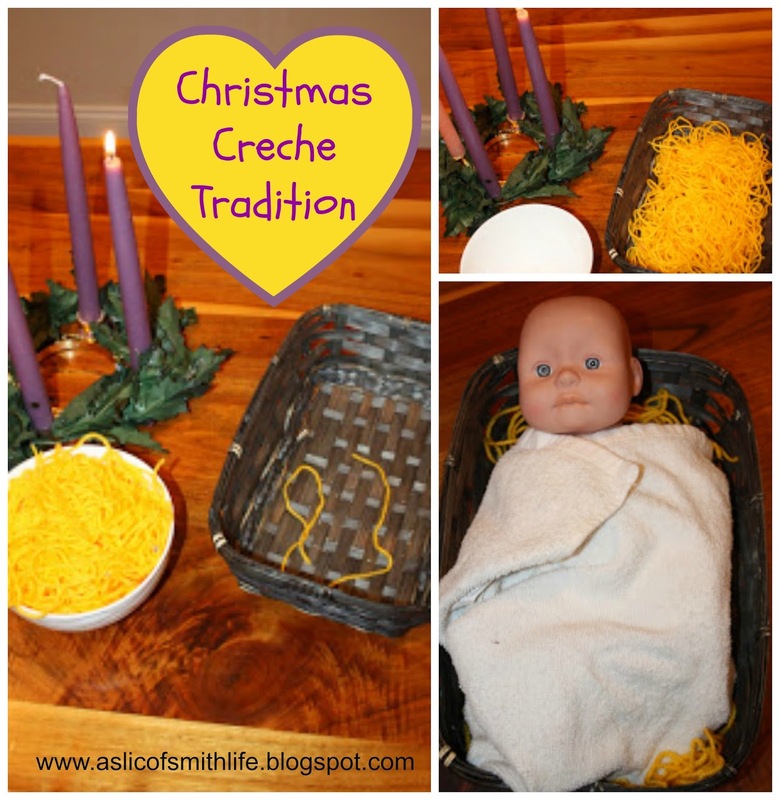 I love Nicole's little cradle she uses for her straw bed for Jesus over at Children of the Church blog. I'll have to put that on my wish list! At the beginning of Advent we start with an empty manger (empty basket) and have a bowl full of "hay" (yellow yarn pieces). On Christmas morning, we will place Jesus in our soft manger built with love and sacrifices and display Him under our Christmas tree. Are you looking for a Christian alternative to the "Elf on the Shelf" craze? 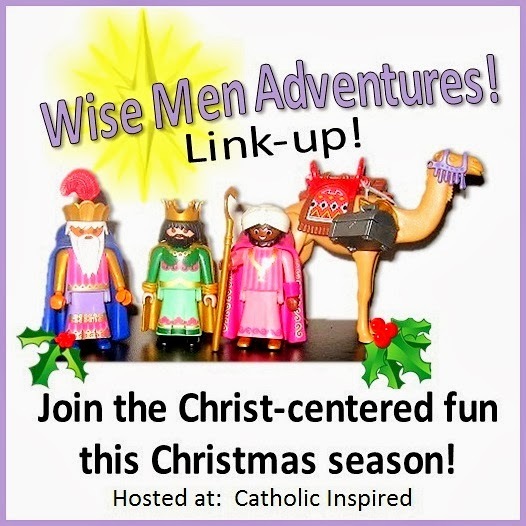 Jennifer at Catholic Inspired started using Playmobil wise men and camels and each day takes them on ADVENTures where her kids find these wondering wise men in humorous situations each morning. She explains it all HERE. Jennifer had a link-up where bloggers could link-up their own Wandering Wise Men ADVENTures and I joined in on the fun! Hopefully, Jennifer will be doing this link-up again this Advent. Jennifer mentions in her blog post HERE how I came up with the "Wandering Wise Men" name, while she started this great and fun tradition! 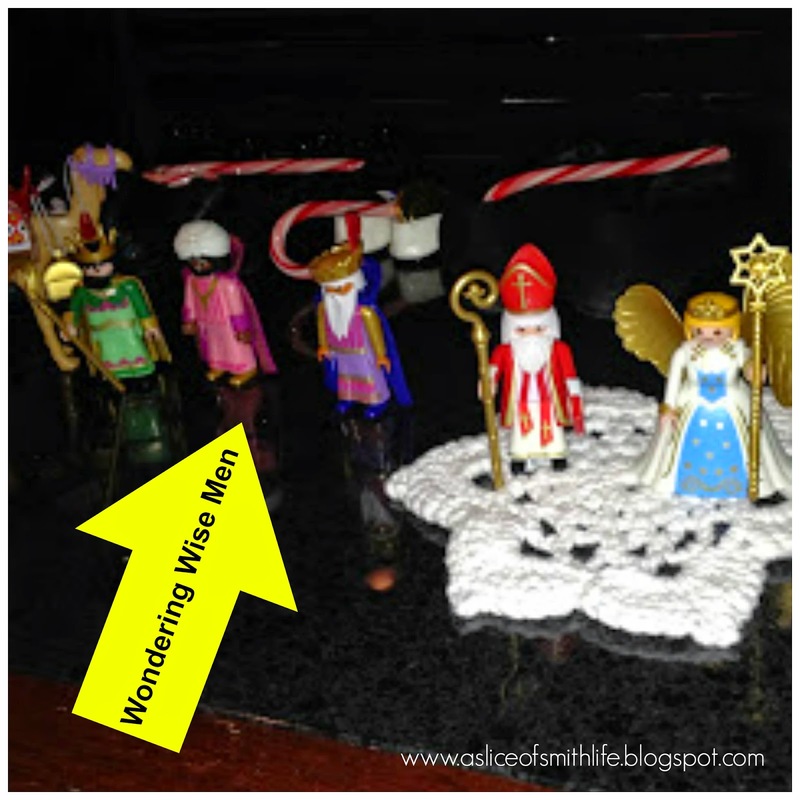 Last year, I took my own Wandering Wise Men and placed them around the house for my children to find each day. It was a lot of fun! Here is one of our ADVENTures last year where my Wandering Wise Men visited Saint Nicholas on his feast day on Dec. 6. If you are interested in the Saint Nicholas and angel Playmobil set you can purchase it HERE. During the season of Advent we also try to remember all the special feast days that are sprinkled throughout the month of December. Below is a list of the dates we observe and celebrate and I have linked posts I have done in the past with each feast day in case you want to look ahead. I plan on blogging more about these feast days in December. You can also Visit My Store to find books about each feast day in case you want to order any. My Store is a work in progress so I'll be adding more items gradually. 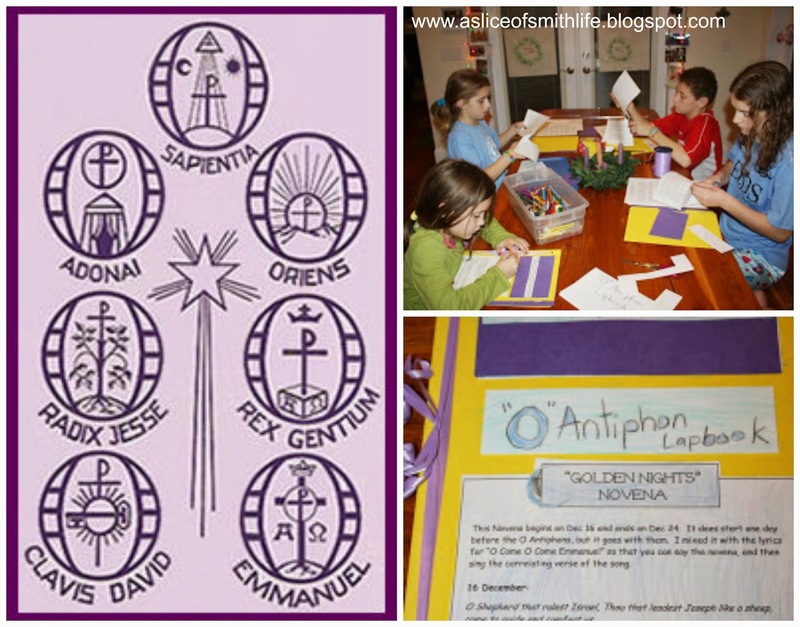 December 17-23: Last year I also tried to celebrate the Octave before Christmas, the 8 days before Christmas Day, with an "O Antiphons" lapbook that I started with my children. We will pull out these lapbooks again this year and finish them and learn more about this special time in the Advent season! The season of Advent is such a special time and I am thankful that our family celebrates the true meaning of Christmas by doing several fun and meaningful Advent activities to prepare for the day when we can sing "Happy Birthday to Jesus!" There are so many wonderful ways to prepare our hearts and homes for the birthday of Christ! I pray my post will inspire you to continue your own traditions or add a new tradition into your home. What are some of your family's Advent traditions? 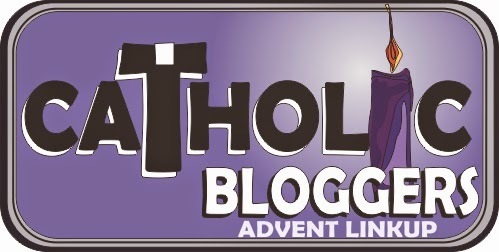 I'm linking this post to the Catholic Bloggers Advent LinkUp, which will be happening during each of the four weeks during Advent. Be sure to visit the LinkUp and find out what others are doing in this season on preparation and LinkUp your own Advent post if you have one! Enjoy! Last, but not least here's a great 1 minute video about what Advent is not and what Advent is! Have a blessed Advent season! 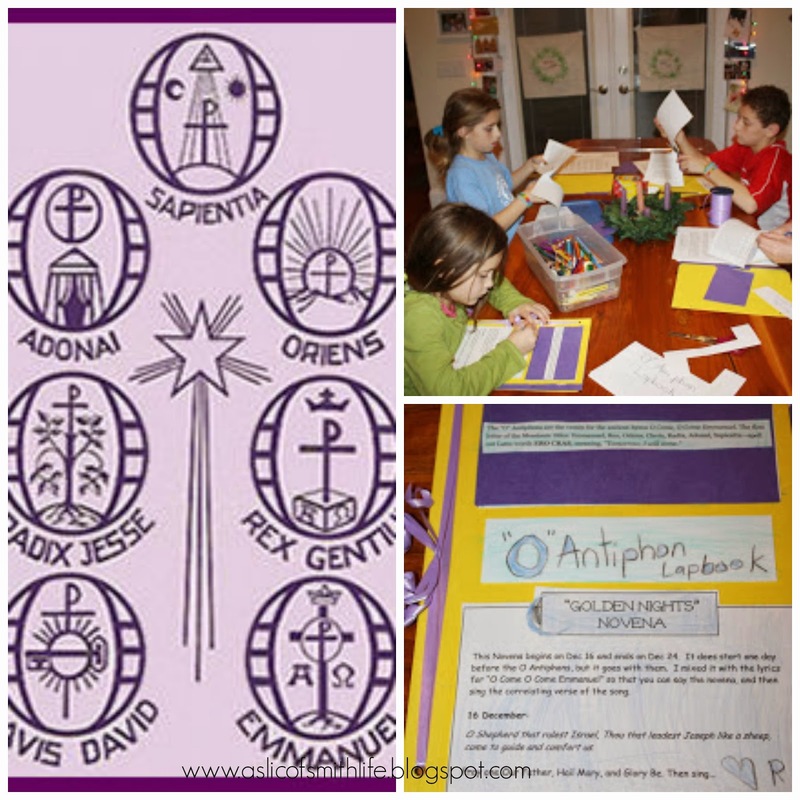 Love all of your ideas and the O Antiphons lap book! Thanks for sharing! Nice summary of Advent traditions, Tracy! I think the yarn straw will be a lot neater than the paper straw can be! Ooh...that reminds me of another Advent craft I need to dig out!...clementine crib and sock baby! Thanks Nicole! I'm looking forward to learning even more about the O Antiphons this year since we just scratched the surface about them last year! Have a blessed Advent! Thanks for stopping in to comment! And I remember the clementine crib and sock baby that you did and I also did that last year! Sooo many ways to keep Christ in CHRISTmas! Have a blessed Advent! Thanks Jen for your visit and comments! I love the wreath too and I'm so glad I bought it at our church's craft fair to remind us about the Advent season! Have a blessed Advent! What a treasure trove of great ideas! I think I'll be making the child's Advent wreath with my grandchildren.... thanks! Thank you so much for this post I have learned so much and will be looking into some of these traditions to add to our family. What awesome ideas. I can't wait to try all of these ideas with my family. Thank you for your visit and comment! Enjoy the wreath activity with your grandchildren! So glad my post gave you another great way to spend time with those you love! Happy Advent! Thanks Melissa! I hope you have a blessed Advent and enjoy some new traditions to make the season fun and holy! 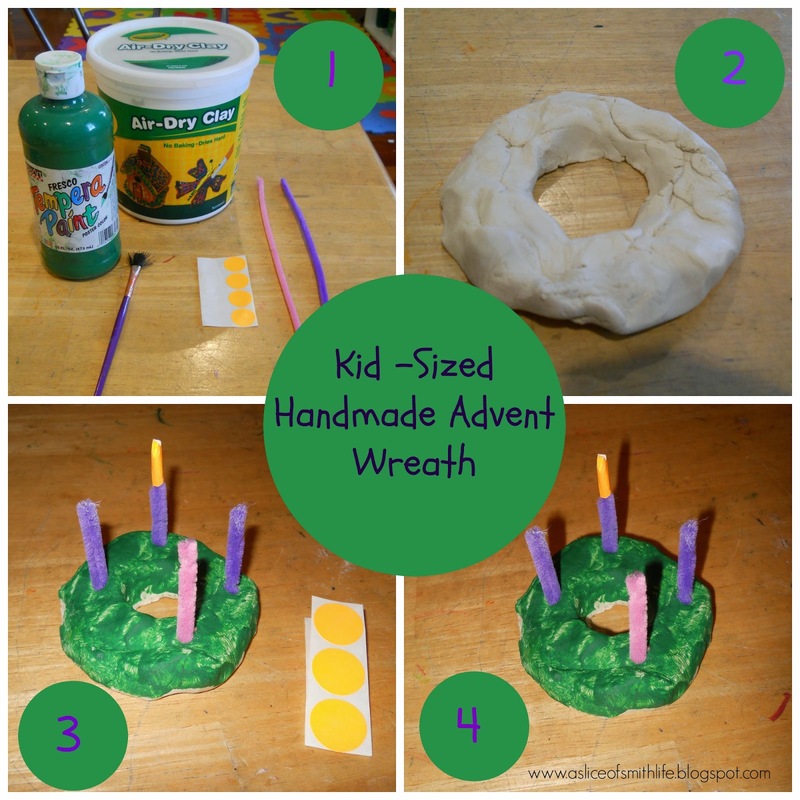 Super cute clay advent wreath. I want to try that with my kids this year! Glad you like the clay wreath! I can't remember where I first saw the idea, but it was fun! Enjoy and happy Advent!